The name Max Harris many will not have heard of, but his music you will. He was a composer, pianist and arranger and was most famous for composing and recording his television theme tunes, the most popular being the outro theme to Porridge which was one of the first sitcoms not to have an intro theme. Max was born into a Jewish family in Bournemouth in 1918 and would have celebrated his 100th birthday this September, but sadly died in March 2004. His father, who was a tailor realised his son’s musical potential and so arranged for him to have private tuition up to the advanced grade at the Royal Academy of Music. After a while and in order to meet the fees, Max would give piano lessons himself. 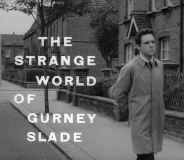 In 1960 he got to work with an up and coming Anthony Newley on his experimental ITV comedy series The Strange World of Gurney Slade, which was scheduled for peak time on Saturday evenings. But nobody laughed; the reaction to the first episode was so extreme that it was rescheduled for 11pm in subsequent weeks. The public loved Max Harris’ theme music, however, which was a modern jazz recording in the style of Dave Brubeck. It was odd series but strangely addictive which involved Newley speaking his mind out loud, but with very little actual dialogue. One particular episode showed him spending the whole time walking a vacuum clear around the streets. I said it was strange and so does the title! The theme, which reached number 11 in the UK chart, was not only used as the theme at the start and finish of the show, but on numerous occasions as incidental music during usually to compensate for the lack of dialogue. It won him Max an Ivor Novello award, but his subsequent singles Pancho and Wheels were not hits, but he did secure another Ivor Novello for Bombay Duck, his theme for the television series Kipling, in 1964. Max worked on numerous radio comedy shows including Round the Horne (with Kenneth Horne) and Stop Messing About (with Kenneth Williams). In 1969 he scored the controversial film Baby Love, starring Keith Barron as a doctor in love with a schoolgirl from the slums played by Linda Hayden. As the 1970s dawned, it became fashionable to manipulate the success of some television comedy series’ by making feature-length films and one of Max’s early ones was to arrange and conduct the score for the very successful film On the Buses in 1971. As well as composing the aforementioned Porridge theme – note the Slade connection as it was the name of the Prison – he worked with Ronnie Barker again when he played the old-fashioned shopkeeper, Arkwright, in Open All Hours. He also wrote the music for the dramas Doomwatch, Horseman Riding By and Poldark. In 1972 Max had the chance to work with the violinists Yehudi Menuhin and Stéphane Grappelli on what was to become a series of very successful albums and the following year he recorded Mister Jelly with the New Red Hot Peppers which was a tribute album to his favourite pianist, Jelly Roll Morton. In the same year, he composed and conducted the score for Carry on England. In the mid-eighties he wrote and conducted the music for Dreamchild, a highly rated film written by Dennis Potter and one of his last works was the theme tune The Attractive Young Rabbi which was a comedy trilogy which aired on BBC Radio Four between 1999 and 2002.